Not everyone relishes the prospect of jumping off the side of a mountain, attached to what is effectively an overgrown kite, but the sport of paragliding is attracting an increasing number of people, with around 4,000 qualified pilots now in the UK. 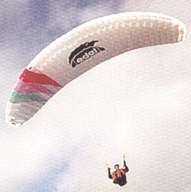 As the competitive aspects of the sport increase, pilots compete for both distance and speed records and the design of the paraglider wing has been evolving to make more competitive products. 'In my view, the improvements in design, which have, until now, been made on a trial-and-error basis, are at a point when they are becoming critical', comments Dr Holger Babinsky. 'The frightening thing is that competition pilots often push their gliders to operate at high speeds and low angle of attack, thus, according to our results, very close to collapse conditions. Any small gust can cause the wing to suddenly deflate.' With stories of wings collapsing and failure of the re-inflation techniques becoming more frequent, it is no wonder that safer design of paraglider wings has become a popular option for fourth-year student (many of whom are qualified paraglider pilots) for their final-year research projects. 'With over 50% of the fourth-year students who have undertaken project work on this topic being active paraglider pilots, they have an understandable enthusiasm for their research, and have produced an amazing volume of research data in this field. It is very pleasing that we can take the student projects to a point where they are useful,' comments Dr Babinsky. There must be many paraglider pilots who echo his sentiment. The work, to date, has used an old-style wing for research but future projects hope to examine an up-to-date competitive model. Further information is available from Dr Holger Babinsky, Tel: 01223 339721.